Sorry this post is late. I worked in the garden with Nisha and her friend, Gaia. There wasn't a great deal to do, but it always helps to have a couple extra gardeners around. We turned the compost pile, weeded the hillside and harvested spinach and chard. I pulled out the last of the flowers near the infested eggplants. We also harvested arugula (found some snails on the leaves--ugh!) and the last two white radishes. I also pulled out some red onions that had the general shape of green onions. I have three avocados I need to cut open and try. They are pretty hard, but maybe they'll be moist, soft and green inside. One can only hope! I worked in the garden today. Time to pull out all the stuff that should be pulled out. Time to let the ground rest, add amendments and other organic additives to make the soil rich and healthy for the spring plantings. What did I pull out? Four eggplants whose fruit was not ripening and whose leaves and stems were full of red spider mites, the broccoli that flowered once, but now are not giving me full heads of broccoli and one jalapeno plant that was actually full of jalapeno peppers, which I harvested, before pulling the plant out of the ground. I also pulled out some carrots and a couple of garlic plants. I don't know what happened with the garlic. They look like green onions in shape, but they smell strong like garlic. However, I am not getting the head of garlic I was expecting. Oh well, next year! I actually worked in the garden yesterday. I turned the compost pile that was pulled out of the tumbler and the bin. It's finally starting to decompose. I also pulled out the broccoli plant on the corner. No broccoli, just flowers. Cut back the eggplant. Checked the garlic--still not ready. I pulled out all the markers for the rows. Pretty soon I will let the garden rest in preparation for spring planting. Bought seeds for organic peas. I want to harvest a lot more peas this year! I also want to plant different kinds of vegetables-- even more variety. Yes, it's true. It has been raining a lot here in southern California. We do get some breaks, but when it starts to rain, it pours. Thank goodness, I live on a hill. All the rain washes across the property to the street. I wonder how all my vegetables will fare. Today is normally a gardening day, but I cancelled it. Even if it wasn't raining this morning (which it wasn't until after 10:30 a.m.) the ground was way too wet to walk on. Nothing to do, except wait for the rain to stop. But I am not unhappy---we need the rain. My two 55 gallon barrels are full of rainwater. I should buy two more tomorrow. Rainwater is so good for the vegetables, and it's free! Wow, did it rain today. Great for my transplanted strawberries. They are looking very happy. Hope all the other vegetables do as well. We have 4 more days of even heavier rain to come. Meanwhile, check out some photos of the Plant It Forward exhibition preview. Open House for Plant It Forward! The photographs are ready and hanging on my studio walls. The video has been edited and is ready to be seen on my laptop (hopefully a larger screen for the exhibition). My daily gardening journal is typed and resting comfortably in a three ring binder on a table in my studio. The artists' journal is ready for viewing and I cut out the article from the Beverly Hills Courier so anyone who is interested can easily read it. Unfortunately, it began to rain just before the Open House began. So I know that dissuaded some people. 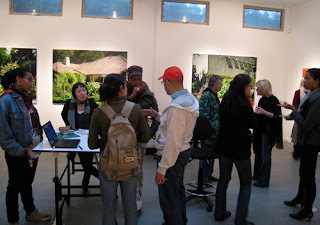 Others called or Emailed with their regrets, but still, I had so many people who braved the weather and came to see the preview of Plant It Forward. Thank you all. I was so busy working in the garden yesterday, that I forgot to write. One person came to work with me in the garden. It was his first time here. I started him watering the spinach seedlings. Then he mixed compost in the two lower hillside beds and we transplanted strawberries. Watered with a Super Thrive mixture, of course, to give them a better chance of surviving. The rain comes Sunday night, so that should help them get over the transplant. Then I pulled out some eggplant. One was covered with red spider mites. In fact, I through a large plastic garden bag over the plant before pulling it out to prevent the mites from spreading more than they would otherwise. It's time to pull out a lot of plants and just let the soil rest. I have some amending to do. I have bad nematodes, as evidenced by the gnarly, bulbous root structure of the tomatoes and peppers. However, even with all the problems, I harvested arugula, eggplant, chard, bell peppers, lemons, rosemary and parsley. Yes, it's been one year since I started Plant It Forward-the starving artist project. My first journal entry was January 13, 2009. "sprayed dormancy oil on peach tree. Planted 1 1/2 years ago." I didn't write much, but it was the beginning of a project that has blossomed and grown. I didn't start the blog until May 19, 2009, but I documented everything I did in the gardens in a journal. The blog was an afterthought, but a good one. I now plan on making a soft cover book of my daily activities as artist/gardener. Meanwhile, it rained this morning, so no one came to work. I really needed the help today. 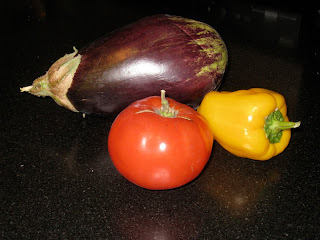 Eggplant and peppers to harvest, alyssum to be pruned, compost to be added, fish emulsion to be added to water for the new spinach and arugula, strawberries to be transplanted. Looks like I'm going to be busy the next few days because I want everything to look great. Why? I am having an Open House this Sunday to preview my exhibition. 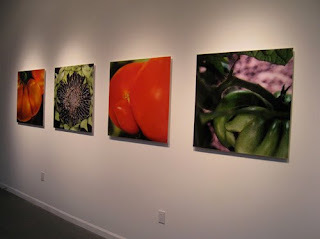 It will include four 48" x 66" photos showing the transformation of the gardens, eight of the eleven 30" x 30" closeups of tomatoes and other vegetables, a seven minute video interviewing the participating artists and two journals--mine and the one the artists wrote in each time they came to work in the garden. I still have to create a soil installation. Where does the time go? Just not enough time!! It's been very dry lately and pretty warm for January--in the 70s. I watered the newly planted spinach and arugula on the hillside. No sign of either yet, but it really is too early. The spinach planted last month is doing well though. I also watered the strawberries on the hillside. I think I need to transplant some of the new little strawberry plants I have from the suckers. The arugula in Garden #1 is coming up, but slowly. The chard in the Raised Bed looks great! And of course, the arugula in Garden #1 and the Raised Bed which was planted in the fall is still going great. I think this Wednesday I will have to harvest the last of the peppers and pull out the plants. Still waiting for the garlic to be ready to harvest. I am going to have so much garlic. I would like to figure out how to make those braids of garlic you see sometimes. Yes, I worked today in the garden. I was hoping to empty both the compost bin and tumbler and have all this amazing compost, but alas--no. Most of the compost was not decomposed and extremely wet. The ratio of green to brown and not too wet or too dry has to be maintained. So, all the material in the tumbler and bin was piled onto a 9' x 12' blue tarp. We mixed in 5 - 6 bags of brown leaves and poured about 1/2 gallon of fish Emulsion and some water on top of it all. Mix well and cover with another tarp. I will have to turn it over in 3 - 4 days. Hopefully, I will get some compost in a few weeks. My plan is to use all the homemade compost in the vegetable gardens in preparation for the spring planting. Even so, I did get a wheelbarrow full of compost to be used in the future. It is resting comfortably in my workshop garage. I also cut back the raspberry plant and added a lot of compost. I didn't get any raspberries last summer, but maybe that's because I just transplanted it. Hopefully, next year I will be inundated with raspberries. I love raspberries! Three people came to work in the garden today: Juna and two new people--Nisha & Ivy. We worked solely on the hillside. Pulled out the last 3 tomato plants and discovered all these white flies and brown spiders within. When plants are done, they just seem to get infested with something. This hillside soil is still very clay-like. Nisha took the pitchfork and loosened the soil for a new planting bed and around the already established spinach and chard plants. Also added compost. We planted a row of spinach and one of arugula. Superthrived well. I pulled out a couple of broccoli plants in Garden #1. They just kept flowering. No new broccoli heads. However, I have about 10 broccoli plants in the raised bed which will be ready soon. Also, pulled out a couple of bell pepper plants and some brown and dying basil. The eggplants are going strong. Can't wait for the garlic--a couple more weeks at least! The gardeners went home with a huge head of arugula, chives, fresh rosemary and dried pumpkin seeds, oregano, basil, thyme and parsley. Oh and a basketful of lemons and limes from my next door neighbor. She never harvests any of the fruit, so I asked if my gardeners could pick the ripe fruit. There will be kumquats soon. With the help of a friend, I pruned my peach tree. Thank goodness I had some help or I would have ruined the tree. Deciding which branches to cut and which to leave is quite a project. Too bad I missed the tree pruning workshop at Tree People last month. That would have helped a lot. Oh well, I will go to the next one. Anyway, after each well-pondered cut, I pasted the cut area with Morrison's Tree Seal, which aids in healing. The peach tree looks very short now. I hope it grows a little taller this spring. I have much to do in the gardens. I decided I better get started. I sprayed dormancy oil on the peach tree, the plum tree and avocado trees. I also sprayed the two flowering plants that were covered with spider mites. Then I fed the Meyer Lemon tree with a chelated zinc/iron mixture (4 Tbs to 1 gallon of water) Tomorrow I will foliar feed the lemon tree with the same mixture. Looks like I might have quite a crowd working in the gardens this Wednesday. I must plan tomorrow what we will do so I can keep everyone busy. What to send them home with?? I hope I have enough food! I picked these Yesterday! Tomatoes in January!